Kinesiology taping, a form of treatment pioneered in Japan is also on the rise in Germany since many years. Not only is kinesiology taping used by top athletes but also in physiotherapeutic practices. Areas of application are mainly focused on different types of pain, restriction of mobility, functional dysfunctions, injuries, muscle tenseness, degenerative diseases of the joints and problems with the lymphatic system. Furthermore the tape application has proven to be quite effective as an additional therapy in orthopedics, neurology and lymphology. 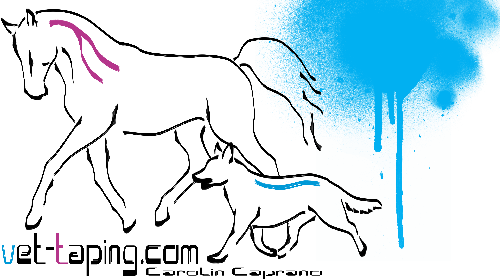 These experiences with the human body can be transferred accordingly also to horses and dogs. 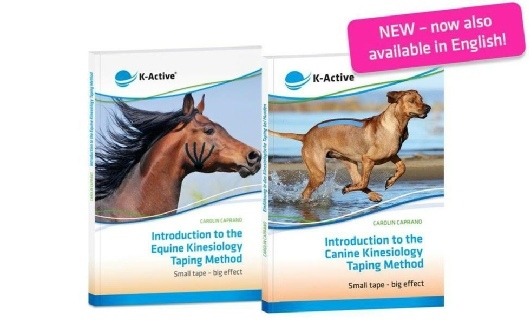 The taping method facilitates a holistic way of considering the equine or canine body with its various networks via body structures such as skin, fascias, muscles and meridians. Prerequisites are the knowledge of the anatomy and a corresponding visual and functional diagnosis. This always takes place incombination with an examination of the skin and fascia shifts in order to fully capture dysfunctions of the equine body. The fascia network extends over the entire body, and also within the muscles. In the case of injuries or inflammations the fascia loses its elasticity, builds up tissue granulation and can become stiff or can agglutinate. Regarding the tape application we can distinguish between the muscle, ligament, fascia, correction, lymphatic and functional technique. Depending on the symptomatic and the corresponding effect you want to achieve you can chose one of these techniques or combine several techniques with each other. Positive effects are: normotonization of a muscle; improvement of the microcirculation; increased amount of lymphatic fluids, positive impact on scars and fibrosis; activation of the spinal and supraspinal analgesic systems; proprioceptive stimulation; passive support and pain relief.